Femoral Perforation after Hemiarthroplasty – Life goes on for 7 years! Introduction: Femoral perforation after hemiarthroplasty is a known complication. 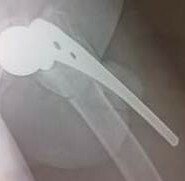 In cases with cemented hemiarthroplasty the recommendation is to leave the implant till it requires revision while for uncemented hemiarthroplasty early revision is recommended. Case Report: We present a case of perforation of lateral femoral cortex after Autin Moore hemiarthroplasty. 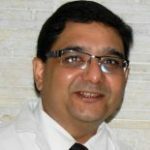 The patient reported a swelling at lateral aspect of thigh immediately after hemiarthroplasty surgery done for failed osteosysnthesis 7 years back. However he was able to continue his activities of daily living for 7 years. He visited us with complains of some pain around the swelling since last 3 months. 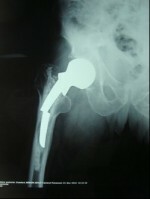 Radiograph revealed a malposiitioned Austin Moore prosthesis with lateral perforation of the femur. 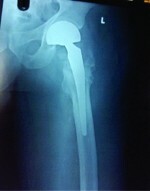 An implant removal and revision total hip arthropllassty is advised but patient declined it and went along with his ‘functioning’ Hip. Conclusions: This is a case of lateral perforation of Austin Moore prosthesis where the patient was able to carry out his daily activities for seven years. Although revision is advised, patient is reluctant and is quite comfortable with his situation.